I was in a chili cook-off today at work. Skipping the suspense and avoiding a setup and punchline, I won. But this was a lot of fun and for a good cause; abandoned doggies. The event raised $900 which was great! But it was very flattering, of course, to have people come up to me and tell me how much they liked my chili, that I should open a restaurant and sell chili dogs (yeah, right) or ask for my "secret ingredient." Secret ingredient? Ha! I'm Mr. Transparent when it comes to food, so I'm happy to share. But I didn't use a recipe, so I'm just going to list the ingredients and encourage experimentation. And other than a few items, no amounts are specified since I didn't keep track. This isn't science but craft. 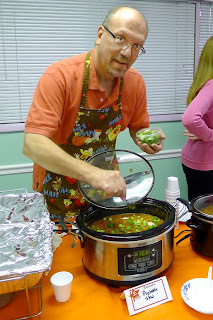 Oh, and while this chili isn't hot, hot, hot (a/k/a Three-Mile Island Chili), it has depth and presence. I went for a bit of complexity and succeeded but it's not mild or bland, so if that's what you prefer, this is not for you. And despite the photo, actual cooking (and reheating the next morning) was done in a pot on top of the stove; the slow cooker was used only for serving.